Two letters calling for an immediate halt to ski area expansion and snowmaking with treated sewage on the holy San Francisco Peaks were delivered by Klee Benally, a volunteer with ProtectThePeaks.org, to acting Forest Supervisor Earl Stewart. The letters were addressed to Obama administration officials including: US Department of Agriculture (USDA) Tom Vilsack, Senior Adviser for Tribal Affairs USDA Janie Hipp, Coconino National Forest Supervisor Earl Stewart, and Counselor to the Assistant Secretary of Indian Affairs Dion Killsback demanding the termination of Snowbowl’s Special Use Permit and the protection of sacred places. 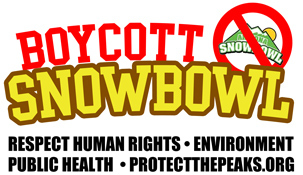 The letters also focused on public health concerns with contaminants in treated sewage effluent that Snowbowl ski resort intends on using for snowmaking on the Holy site and demanded a moratorium on the use of reclaimed wastewater in public places. After protesters exited the lobby, an unknown individual tipped over a 5 gallon bucket full of treated sewage effluent, flooding the Forest Service lobby floor. Snowbowl plans to make fake snow with 100% reclaimed effluent November, 2012. This treated effluent has been shown to have contaminants such as antibiotic resistant genes and endocrine disruptors. Putting this water on the mountain is not only threatening all life which come in contact with it, but also the cultural integrity of more than thirteen Indigenous Nations.